Are you looking to take your Apple Watch with you on all your adventures - swimming, hiking, climbing, skiing, fishing, camping or diving... then the Catalyst Case is for you. Introducing the first of its kind, a fully functional, waterproof case for Apple Watch. kick "add to cart" button to be able to take your Apple Watch everywhere! Please feel free to contact us if you should have any further questions. AWARD WINNING SIGNATURE DESIGN - The Catalyst case for 42mm Apple Watch Series 3 is FULLY COMPATIBLE with the 38mm Apple Watch Series 2. This is the world's first and only Apple Watch case that guarantees total protection. Original. Just like you. IP68 WATERPROOF TESTED. ADVENTURE READY - The Catalyst apple watch cases for the 38mm Apple Watch Series 3 has a waterproof score of IP68. Dive as deep as 330 feet (100 meters). Embrace the adventure, have fun and don't worry about water damage. QUICK & EASY ACCESS TO ALL FEATURES - Made with maximum precision, the Catalyst apple watch cases always keep your Apple Watch protected, but also fully functional: Bluetooth, heart rate monitor, speaker, and microphone are all easily accessible. 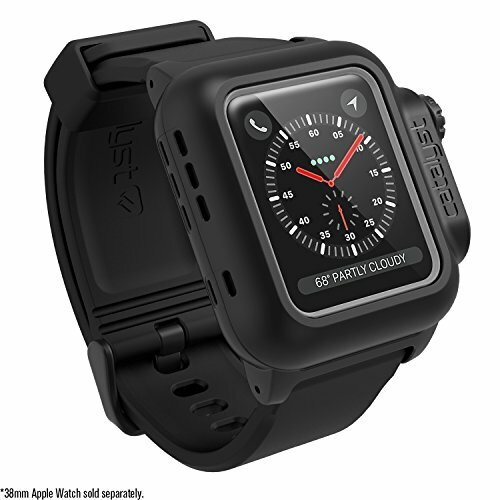 HIGH MILITARY RESISTANCE TO DROPS - This resilient Catalyst apple watch 38mm case exceeds MIL-STD 810G military standard for shocks & drops up to 6.6ft (2 meters). Made of rugged, shock resistant, scratch proof polycarbonate and a light silicone. THE FINEST DESIGN. PRECISE CUTOUTS - The Catalyst Case for 38mm Apple Watch Series 3 allows complete, seamless access and control of all buttons, sensors including signature rotating crown dial and the tactical side button. A perfect, flawless fit. If you have any questions about this product by Catalyst, contact us by completing and submitting the form below. If you are looking for a specif part number, please include it with your message.